In a meeting with Topware interactive today, I was given a first look at the upcoming "Pirates of the Flying Fortress" expansion for Two Worlds II. This new adventure takes place after the events of that game and delves into, well, a pirate-y adventure. 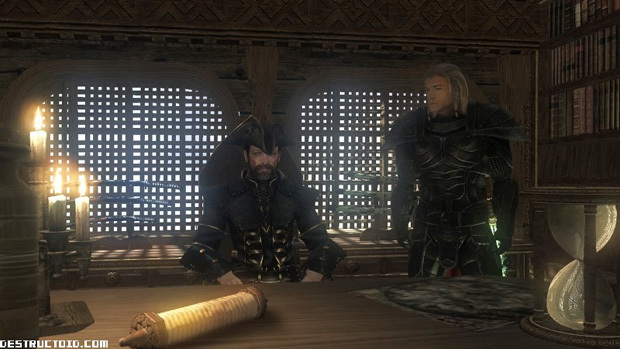 As seen in an opening cinematic shown in the meeting, your character has been pressed into the employ of a vicious pirate captain, Ed Teal. From his ship, the Wandering Wraith, the player is sent out to perform quests in a series of small islands in Kangor Bay, traveling in a rickety sailboat from one to the next. TopWare says they're very serious about this expansion, taking player feedback from Two Worlds II to try and make the best possible experience for the fans. Voice-over work has been completely redone and the team is packing in loads of new animation. Mounts are also being improved with new breeds of horses, all new mounts (including a Warg-inspired beast yet to be named or seen) and what TopWare called, "impact oriented horse armor." I was shown the boat travel between the islands, which looked lovely, shrouded in mist. There was also a graveyard sequence to demonstrate the combat, which appears as heavy and satisfying as before. All in all, it seems like TopWare is giving the fans what they want with the expansion with an expected ten hours of new content and the game's single-player world increased by twenty-five percent in size. Two Worlds II Pirates of the Flying Fortress will release this October for PC, Mac, Xbox 360 and PS3.